The provisional government as initially set up by Khomeini and his supporters was a coalition of religious and nationalist leaders who had moderate views on social and economic changes. 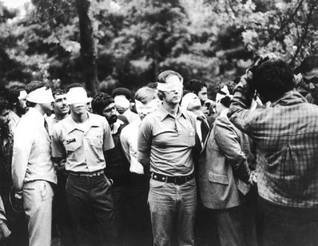 Mehdi Bazargan was appointed Prime Minister, but he soon came into conflict with young militants and more radical religious leaders. Throughout his years of exile Ayatollah Khomeini had developed an ardent anti-Americanism. Immediately after the Revolution, the Bazargan government still hoped to (re-)establish solid diplomatic ties with the US, in part because of the need for weapons. But anti-American sentiments ran high after the downfall of the Shah, and Khomeini himself continued to use strong anti-American rhetoric. Anti-American sentiments reached a high point after the Shah was admitted to the United States for medical treatment in October 1979. On 4 November the American Embassy was occupied by a group of revolutionary youth, who called themselves the Students Following the Imam’s Line, demanding the extradition of the Shah to Iran. The take-over was the beginning of a hostage crisis that would last 444 days. The ‘den of espionage’, as the embassy was called, became the focal point of radicalism, and the American hostage crisis turned into an important tool in anti-American propaganda. The hostage crisis led to the collapse of the provisional government and a break in relations with the United States. Following Bazargan’s resignation on 4 November, the Revolutionary Council took over the Prime Minister’s functions, pending presidential and parliamentary elections. On 25 January 1980, Iran’s first presidential elections were held. Abulhassan Banisadr became the first elected President of the Islamic Republic of Iran. Differences between the moderate and militant factions of the revolutionary government soon worsened.